What is the Adult Mental Illness Chemical Addiction Program (Adult MICA)? The Adult MICA Program offers group therapy and medication management 1-5 days a week depending on the individual's needs. 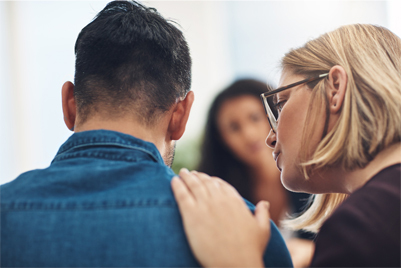 Group therapy runs Monday, Wednesday and Friday from 8:30 a.m. -11:30 a.m. Group members will learn about substance abuse patterns, the process of change, relapse prevention and mental health wellness. Each day in treatment consists of a clinical group counseling and education session with an option to discuss medication options with a prescriber. The treatment team consists of a master level clinician, mental health technician and psychiatric APN. Katie is the master level clinician for the MICA program. She received her master's degree in Clinical-counseling Psychology from La Salle University and her bachelor's degree in Psychology from Stockton University. Katie began working at Jefferson Behavioral Health in 2009 and has worked at all three campuses. Prior to working at Jefferson, Katie worked in community mental health counseling settings and medical units doing crisis intervention, psychiatric assessment and substance abuse evaluations. Katie’s clinical interests include mindfulness based relapse prevention, holistic wellness and evidence based program development. Katie grew up in South Jersey and recently moved back to the area. For more information on the Adult MICA program, please call 856-582-1419.